BOSTON, MA--(Marketwired - Jan 6, 2016) - Auto manufacturers will need to meet aggressive fuel efficiency targets over the next decade -- 54.5 miles per gallon (mpg) in the U.S. and Europe's 95 grams of carbon dioxide emission per kilometer. While advanced technologies like all-electric vehicles, super-light carbon fiber composites, and hydrogen fuel cells will all be available, Lux Research's analysis found that micro-hybrids will provide the most economical route to meeting 2025 targets. In a micro-hybrid, the car can automatically stop its engine when it would otherwise be idling, using an improved or an additional battery (or another type of energy storage) to quickly restart it when it's time to move -- some even capture braking energy and do propulsion assist. Nearly half of the improvements required to meet the stiff targets will come from improvements in micro-hybrid technology, notably through improved batteries, while lighter structural materials will contribute 39% and improved fuels will add 13%. "The automotive industry is under intense pressure to lower emissions and increase fuel efficiency. Improved energy storage options will help make micro-hybrids the most cost-effective way to respond, along with ongoing improvements to lightweight materials," said Anthony Schiavo, Lux Research Associate and the lead author of the report titled, "Building the Car of 2025: How to Cost-Effectively Get to 54.5 MPG Using the Right Mix of Advanced Technologies." 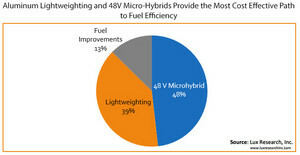 Micro-hybrids lead the charge based on energy storage advances. Innovation in micro-hybrid technologies will be the biggest factor in the march towards greater fuel efficiency, contributing 48% of the improvements required to meet 2025 targets. Falling prices of lithium-ion batteries, lighter and better-performing 12V and 48V batteries, and better supercapacitors are among the changes powering energy storage. Lighter materials are key. Lighter structural materials are at the heart of fuel efficiency and would contribute a hefty 39% of the targeted improvements for 2025. Carmakers such as Ford and GM have ongoing partnerships with companies like Alcoa and Nanosteel Company that develop materials to reduce weight. Alternative fuels help, too. A third, albeit smaller, factor driving fuel efficiency is innovation in alternative fuels. About 13% of the improved 2025 targets will come from increased Research Octane Number (RON) content due to increasing biofuel blending mandates. Brazil has the highest target of 27.5% for ethanol, while the U.S. aims for 20% by 2022 for all renewable fuels. India and Thailand have set 20% targets, while Europe lags at 10%. To learn more about this topic, register for the complimentary webinar, "0 to 100: the Rapidly Accelerating Future of Automotive Efficiency" on January 12th at 11:00 am EST. The report, titled "Building the Car of 2025: How to Cost-Effectively Get to 54.5 MPG Using the Right Mix of Advanced Technologies," is part of the Lux Research Advanced Materials, Energy Storage, Autonomous Systems 2.0, and Alternative Fuels Intelligence services.